Love isn’t easy to define. You can say it’s a feeling, or a lifestyle, or just a bunch of neurons going off in your brain. What I believed about how love should be shared has changed a lot since I was a teenager, but I still believe that what it really means is that you’re there for someone when it really matters. I’ve never been a fan of Valentine’s Day regardless of my relationship status, but I’m all for telling all of the people I love that I love them. When I started writing this post, I was a little stumped. I wanted to write something in the spirit of Valentine’s Day, but it felt odd. My husband knows I love him, but what would someone else want to know about it? 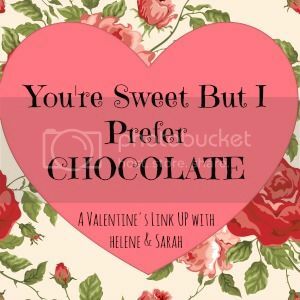 Then I discovered Sarah & Helene’s Link-up, so I decided to make it a two-part post for you. The way I love my husband is different from the way I love anyone else. We met at a get together and started dating. That didn’t last long but we ended up as friends. One night in June, I let him take me to the movies and there was a spark. All of a sudden we were engaged! It took me some time to realize how awesome he is, but I’m glad to say it happened. Now he’s my best friend, my boss and the guy who delivers my cupcakes. He went out this morning to get me one from Crumbs. I love him because he surprises me with things I like even though I hate surprises. Last year on Valentine’s Day he contacted my boss to ask for a day off. Next thing I know, I’m packing for a long weekend in Las Vegas. I love him because of that that time we drove to Wal-Mart at night when I wanted a snack. We left with only milk and donuts. He told me that we’d have to eat them all that night. Fast forward to about 10 pm in our car, sitting by a pier. We have finished all of the donuts and milk. It was romantic, I swear. I love him because he is my biggest fan. He motivates me when I need it and supports me when I have my own things going. He reminds me that it’s cool to be who I am, but also drops hints when I need to be a better person. He tells me to stand up for myself and helps me remember what’s important in life when I forget. Snuggle on the couch. Watch a movie. Make tacos for dinner. Exchange cheesy cards. One year I actually made him a card that said “You are my cheese.” That’s just how we do. Gifts are great but the things that show you were really thinking of me are the best. Cupcakes are always on that list. This year, I’d like to publicly share my attempts at a Valentine’s Day card in the form of haiku’s. Feel free to save and share the images. They’re also available on Pinterest and Facebook. What are your vacation moments? that sounds like the perfect way to spend valentine’s together! and being best friend’s with your husband is the best way to be!! Exactly! I don’t know how else it could work. Thanks for stopping by Helene! This. Was. So. BEAUTIFUL. *hypothetical tears* Wow, so he’s pretty awesome to bring you cupcakes for Valentine’s Day. Sure if it were me, I would require a cupcake everyday. And the fact that he is now more important than chocolate translates it all for me.